In the conventional sense of the term, a circuit breaker or a fuse is a contraption that safeguards electric circuits from overload and break down. Equity exchanges across the world use a similar mechanism called the circuit breaker, that prevents short term massive swings or volatility in the markets. A circuit breaker halts all trading across a whole exchange or in a particular stock for some time as soon as the price of a stock or a market index moves beyond a certain percentage from the previous day’s closing price. A circuit breaker is needed because wild price swings are mostly irrational. Circuit breakers are placed in tiers wherein different rules and different periods of shutdown come into force at different price levels. Further, before reopening, exchanges call for buyers and sellers to bid on stocks and indices in what is called a pre-open call auction session. A circuit breaker halts all trading across a whole exchange or in a particular stock for some time as soon as the price of a stock or a market index moves beyond a certain percentage from the previous day’s closing price. For example, a 10% fall in the Nifty 50 index (a market index in the NSE exchange) from the previous day’s closing price triggers a market shut down for forty five minutes. A market index is a weighted average that reflects the price of a number of stocks as a single composite price. Thus, a market index can serve as a convenient proxy for wider market price changes (if it takes the right mix of stocks into account). 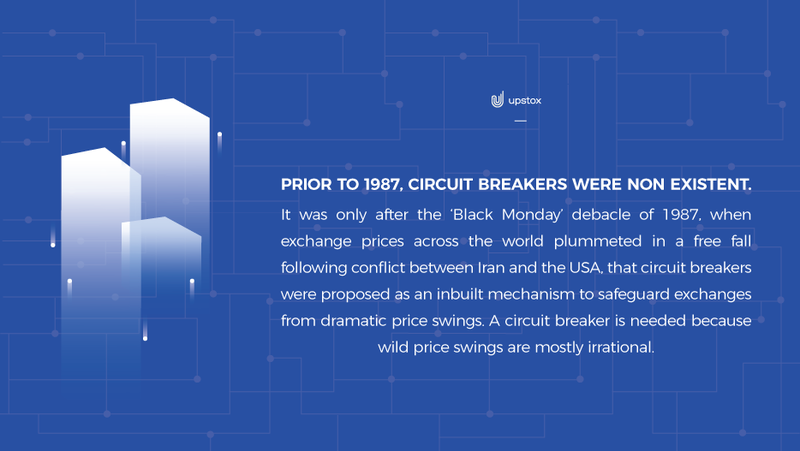 Circuit breakers that shut down entire exchanges are activated based on price changes in a market index (representative of the price movements across the greater part of an exchange). Exchange wide circuit breakers which halt trading across the entire exchange based on market index price changes are in effect across almost all exchanges. In contrast, stock specific circuit breakers are generally not in use. Each exchange has its own rules that trigger a circuit breaker. A circuit breaker can be triggered by an abnormal price rise as much as by a fall–depending on the exchange’s rules. Why is a circuit breaker required? Wide swings in prices cause panic among traders resulting in massive sell offs, more so if smart automated algorithms are used by some. A shut down for some time tempers investor sentiment and quells speculative hysteria by allowing time for dissemination of information enabling rational decisions. This stabilises markets and upholds investor confidence in the fairness of the market. Circuit breakers are placed in tiers wherein different rules and different periods of shutdown come into force at different price levels. For example, if a 5% price drop causes a 30 minute shutdown, a further 5% drop following reopening (10% drop in total) could result in a shutdown for an even greater period of time or for the rest of the day. Usually, exchanges have a three tiered system where each tier comes into play at different percentage points. Some exchanges also have time specific rules for triggering circuit breakers. For example, a 5% price drop that would trigger a shutdown any other time, might not cause a shutdown if the fall takes place during the last five minutes of trading in a day. Further, before reopening, exchanges call for buyers and sellers to bid on stocks and indices in what is called a pre-open call auction session. This allows for exchanges to fix stock prices rationally when markets reopen after a shutdown, based on wider market demand and supply. Stocks reopen at the price discovered through bidding. This measure shores up investor confidence in the stock price as it is backed by investors participating in the exchange. Indian exchanges National stock exchange (NSE) and Bombay stock exchange (BSE) use the BSE Sensex and Nifty 50 indices as benchmarks or references in the activation of circuit breakers. As soon as one index breaches a price level, both exchanges (NSE and BSE) are shut down. The tiers are activated at 10, 15 and 20 percentage points from the previous day’s closing price. Both rise and fall in price trigger circuit breakers. The periods of shutdown, duration of pre open call auction session following a shutdown and variation in rules based on time of the day are listed on the NSE daily market wide Circuit breakers, where you can also see prices at which each tier would be activated calculated based on previous day’s closing prices. Circuit breakers have been activated in the Indian exchanges following greater than 10% crashes in index prices (Example – BSE sensex crashes triggering shutdowns occurred twice in the year 2008). Circuit breakers have also had to be activated following wild upswings in the indices (Example – Circuit breakers were enforced twice on the day the results of the 2009 parliamentary elections were announced). Circuit breakers are safety mechanisms that are inbuilt into exchanges to protect them from wild short term fluctuations. Circuit breakers bring about a temporary shutdown of all trading across an exchange to calm market sentiment following irrational price swings. In allowing time for speculative hysteria to die down and effective dissemination of information, shutdowns enable investors to make rational decisions as the market reopens. Circuit breakers are arranged in tiers which come into play sequentially at different price points. Before reopening, stock prices are fixed rationally by allowing prospective buyers and sellers to bid for sometime in what is called a pre-open call auction session.